The Colette Ceylon dress is complete! This dress taught me a lot. Not because it was necessarily hard, but it required some techniques I had never used. In the end, it's the little details that I enjoy the most about this dress. 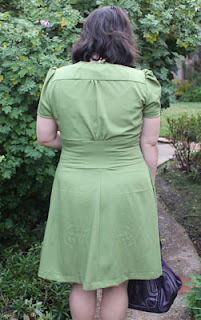 I love the gathers on the skirt front and the back of the dress, and it has so many elements that make it such a flattering fit. It's the perfect dress for a date with the hubby or to wear to work when I want to mix up the business casual requirement. The only aspect that I changed from my original plan were the buttons. I had originally planned on fabric buttons and had all the materials, but they were seriously going to drive me to drink! I couldn't deal with fumbling of the fabric into the tiny little button and sealing the snap down. I eventually (after two buttons) made a run to JoAnn's to pick up another alternative. I'm happy with the end result and will just have to save those buttons for another project... one where someone with tiny fingers can assemble them for me. To read more about the journey making this dress, check out the original post here. Great colour, great details! Nice work babes! This is so sweet! I love the details, the fit, and the fabric goes perfectly with it. Really cute! This is really cute, so perfect for spring! Great version of this dress, I love the colour! Very nice! I like the color. And the shoes fit the style. This is so sweet and springy. I would wear it. 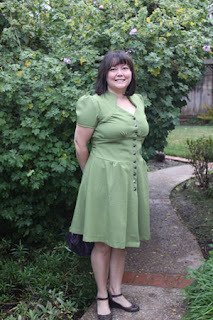 This dress is just so cute: the color, the shape, everything. You look fabulous! First milestone and a giveaway!